Around 20% of all road fatalities can be caused by fatigue, according to government statistics*, yet fatigue is one of the most preventable of all factors contributing to the occurrence of road accidents. 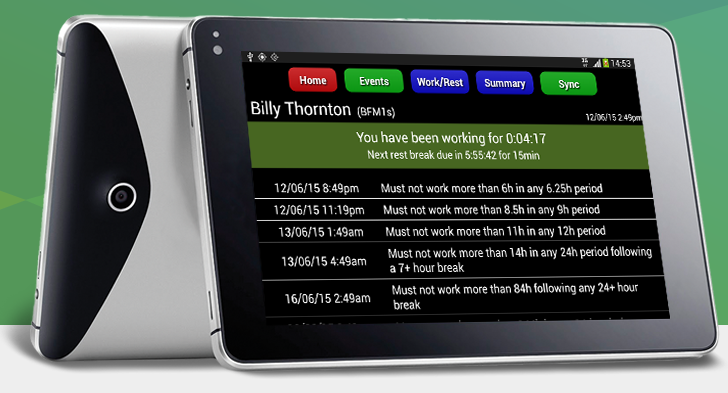 A growing number of Australian transport and logistics organisations are taking a more proactive approach to the management of driver fatigue through the deployment of Electronic Work Diaries (EWDs) to augment the paper-based work diaries currently needed to comply with safety legislation. Transtech, one of the most experienced Australian developers of fatigue management systems, recently released a new version of their Sentinel EWD for real-time online and offline driver fatigue management. Sentinel uses the iFace, a 7″ in-vehicle touchscreen device, for mobile interactivity. “Transtech and CMS have worked together collaboratively on integrated and complementary solutions for a number of major transport companies,” said Grant Walmsley, general manager of CMS Transport Systems, developers of the Freight2020 transport management system. “Any Australian transport company with a heavy-vehicle fatigue management system already in place should be commended for showing commitment to improving worker safety and reducing the road toll,” Grant said. * Estimate deduced from fatigue-related road accident and crash fatality statistics quoted by the Traffic Accident Commission of Victoria and Australian Transport Safety Bureau.